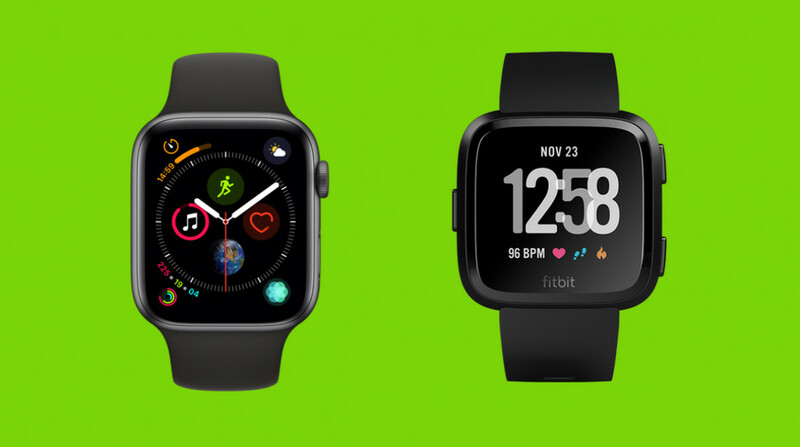 The Apple Watch and Fitbit Versa are two mainstream, everyday smartwatches with their own app stores and a focus on health and sports tracking. In short, two of 2019's most popular smartwatches have a lot in common. However, they're far from identical. The Series 4 doesn't work with Android phones. The Fitbit Versa is half the price. The new Apple Watch offers potentially life-saving health tech. The Versa has more than four days of battery life. We've spent plenty of time with both devices, and we know the design, specs and features like the back of our hand. Read on to learn all the differences, and see which comes out on top. At first glance, the Apple Watch and Fitbit Versa look fairly similar, but, if you've seen both in person, you'll know that's not exactly the case. As we'll dig into, the Series 4 is double the price of the Versa (at least) – and it shows. The Apple Watch feels more polished and premium, certainly. It comes in aluminium (space grey, silver, gold) and stainless steel (LTE only – space grey, silver, gold) and the Digital Crown now has haptic feedback, which is a nice touch. The Versa comes in black, grey and rose gold – if you want the charcoal finish, you'll have to go for the Special Edition, which also gets you an NFC chip for Fitbit Pay (in the US, all models have it in Europe) and fancier woven straps in the box. It doesn't look cheap by any means, it just looks the part of a mid-range smartwatch. Nothing luxe here, but nothing offensive, either. Now, the Versa is small and very light to wear on the wrist. It's 11.2mm thick and the display is 1.34-inch diagonal – only the straps come in small and large sizes. Small is for wrists 5.5-inches to 7.1-inches in circumference, and large is for wrists that are 7.1-inches to 8.7-inches in circumference. The Apple Watch Series 4, meanwhile, comes in 40mm and 44mm sizes – there are no smaller 36mm or 38mm options here. However, it's worth noting that there's a larger display on the 40mm Series 4 watch than the 42mm Series 3. It's slightly thinner than the Versa at 10.7mm, too. Both smartwatches are waterproof to 50m. Health and sports are now a big focus for both Apple and Fitbit, but both the Series 4 and Versa act as everyday smartwatches, too. So, let's start with how they compare here. As we said, the Fitbit Versa works with both iOS and Android and its smartwatch features are also stronger on Android. Fitbit OS includes watch faces, notifications and quick replies – on Android; NFC payments (in Europe and on the Special Edition in the US) and your Fitbit activity and history including steps, calories burned, resting heart rates and recent exercises. There's also an app store, but the selection still isn't huge, despite Fitbit's efforts to increase interest. Plus, there's music storage for around 300 tracks. The Apple Watch Series 4 is a more fleshed out smartwatch. As well as watch faces, notifications, quick replies, Apple Pay, activity tracking, music storage and a much livelier app store, there's also the option for LTE calling, a new Walkie Talkie function and Siri voice controls. As for screens, the Versa has a 300 x 300 resolution display, with brightness up to 1,000 nits. Apple has more pixels to play with and does a good job of hiding the bezels. The 40mm Apple Watch Series 4 has a 324 x 394 OLED display and the 44mm Series 4 has a 368 x 448 screen – both also up to 1,000 nits brightness. On health and sports, the main difference between these two watches is that the Apple Watch Series 4 comes with GPS built-in and the Fitbit Versa… doesn't. So, you'll have to take your phone out with you on a run to use its 'Connected GPS'. The Versa does have a heart rate monitor, though, and can track running, cycling, swimming (remember, it's waterproof), yoga and gym workouts. There's also sleep tracking built in, with Sleep Stages and insights, whereas on the Apple Watch you're left to rely on third-party apps. Fitbit Coach has a couple of options for free, as well, but if you pay you get access to personalised workouts. Still annoying – you can't share any of this data to Google Fit or Apple Health. Especially useful on the Versa is female health tracking. It means women can log their menstrual cycles and symptoms and gets tips and feedback. The Versa is also one of the few Fitbit devices with a relative SpO2 sensor, capable of measuring blood oxygen levels, though this still isn't live. The Series 4 is a neat, do-it-all sports smartwatch. It has built-in GPS, as we said, and there's also GLONASS, Galileo and QRSS; a tweaked optical heart rate monitor; a barometric altimeter, a breathing app and automatic workout detection in watchOS 5. An improved, more precise accelerometer and gyroscope mean that the Apple Watch can now detect falls – it can even be set to contact family and friends/emergency services via its existing SOS feature if it spots you've fallen. And, of course, the big story with the Series 4 and Apple Health is the new ECG (electrocardiogram) monitor. This medical grade sensor means you can get an ECG reading by placing your finger on the Digital Crown, with it tracking any abnormal measurements and potentially helping to detect atrial fibrillation. It's a big step towards defining what smartwatches can do, and gives the Apple Watch the edge when it comes to health tracking from the wrist. The Series 4 has a similar battery life to the Series 3, which is a day or so per charge. Officially, it's 18 hours, and it charges via the magnetic charging puck. So, those hoping for a real improvement in this department are left wanting. This is one area where the Fitbit Versa really shines compared to the Apple Watch. The Versa can go for four days on one charge, and we've often managed to get five days out of it in testing. By our complicated maths, that's way over double what you'll get from the Apple Watch, which really makes a difference in use. Charging your smartwatch once or twice a week rather than nightly also makes more sense when you consider that the Fitbit Versa has native sleep tracking, so you're probably more likely to wear it to bed. It charges via a charging dock. Another big tick in the Fitbit Versa column – it costs $199.95, which is a real sweet spot in terms of how much people want to spend on a smartwatch. You can then pay more for extra silicone, Horween leather or stainless bands, either from Fitbit itself or through the wide range of third-party Versa bands (though Fitbit advises against this to ensure HR accuracy). The Apple Watch Series 4 starts at $399 for the regular GPS model and at $499 for the LTE models. You can choose from the Nike and Hermes editions that can run into the thousands, and there are lots of first and third-party straps and bands to choose from. Let's start off by saying that both these smartwatches are terrific options, compared to the competition. There's a reason Apple and Fitbit smartwatches sell in the millions, where others struggle. For most people, the Fitbit Versa is a great smartwatch all-rounder for the money. And if the Series 4 looks steep, there's also the cheaper $279 Apple Watch Series 3 to consider. Fitbit also offers a cheap alternative to its smartwatch, with the Fitbit Versa Lite Edition landing earlier this year. There are a couple of big reasons you'd be better off with an Apple Watch, though. Built-in GPS will be a dealbreaker for a lot of people, as will LTE if you want to use this as a standalone device. The only real reasons to plump for the Fitbit right now are the price and battery life, though the latter is something we expect Apple to improve on through the Series 5. As ever, it's a personal decision – you might like Fitbit's fully integrated female health tracking, or the wide range of apps and straps for the Apple Watch. How big an upgrade is Apple's new smartwatch? Do you go Versa or Galaxy Watch?